Gastro-intestinal infections represent one of the most common group of infections, especially so developing countries. Hygiene is the most contributing factor with paediatric population at highest risk. As per the statistics Rotavirus is the leading cause of severe diarrhoea in children in developed and developing countries. The Statistics from Indian scenario is not very good but the estimates are that approximately 1.5 lakh children die from rotavirus infection in India each year. The launching of indigenously developed Rotavirus vaccine recently has been welcomed by many. Here is some basic details on Rotavirus and vaccine program. 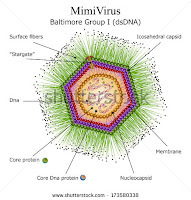 Rotavirus (Reoviridae family) was first identified in 1973 as a viral etiological agent of diarrhoea. Structurally it resembles a wheel-shaped virus. Its genome consists of 11 double-stranded RNA segments coding for six structural proteins (VP1, VP2, VP3, VP4, VP6 & VP7) and six nonstructural proteins (NSP1-6). Virion spike containing VP4 is proteolytically cleaved by intestinal proteolytic enzymes (Mainly trypsin) to yield VP5 and VP8. 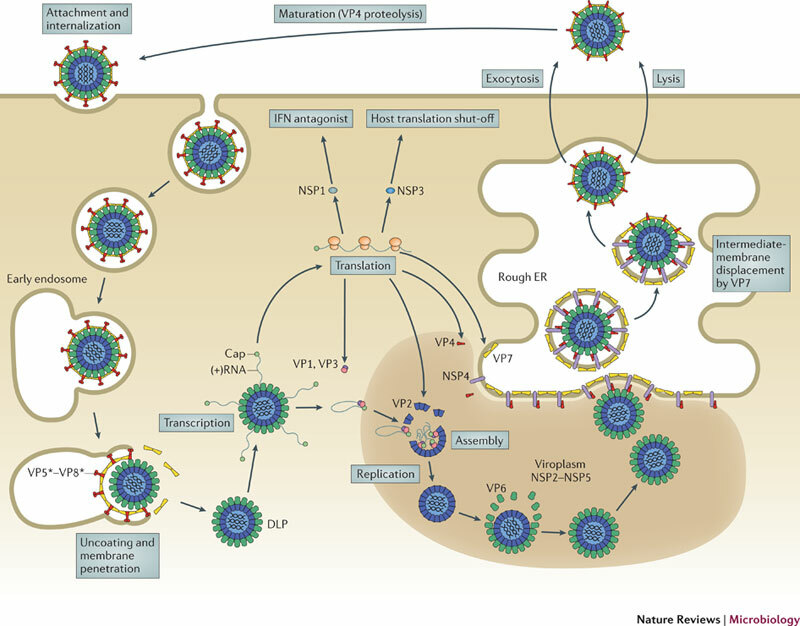 VP5 is primarily responsible for permeabilisation of cells to the virions. 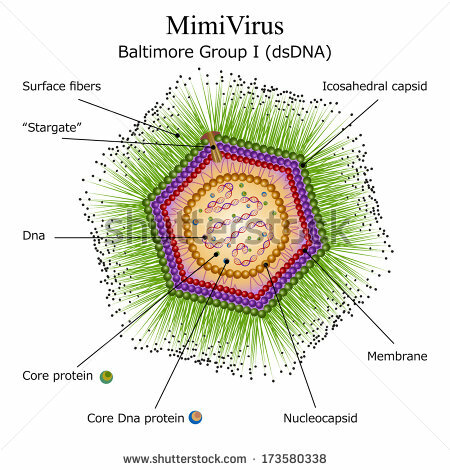 There are at least eight species of this virus, referred to as A, B, C, D, E, F, G and H. Among all of them Rotavirus A is responsible for more than 90% of rotavirus infections in humans. Rotavirus is a completely preventable infection, since the neutralising antibodies against the spike proteins are effective. The very first vaccine that was tried against Rotavirus was introduced in 1998. This consisted of Bovine rotavirus strain NCDV (Nebraska Calf Diarrhoea Virus) which was renamed as RIT4237. Subsequently Rhesus rotavirus (RRV), and later a RRV reassorted with human rotavirus VP7 proteins with G-types G1, G2 and G4 was used which was called as RRV-TV (RRV- Tetravalent). This was marketed as RotaShield from 1998. It was then withdrawn, with the observation that it was associated with intussusception. Following these, several other vaccines have been tried and tested, as shown in Table 1. Of these RotaTeq and Rotarix has been licensed for commercial purposes. The pilot studies by Bharath Biotech was done on 2 strains- 1132 and 116E. 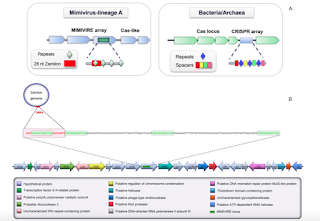 According to the patent details filed, The human rotavirus strain 116E is a human-bovine reassortant with human G9 strain containing bovine VP4 gene homologous to the P[I l] gene segment. The 1321 strain is Gl OP [1 1], primarily composed of bovine genes and has only two gene segments of human origin, VP5 and VP7. The original 1 16E (G9[P11]) and 1321 (GlOP[I l]) were adapted to grow in cell culture by passages in primary African green monkey kidney (AGMK) cells then in MAl 04 cell substrate and later in serially Passaged AGMK (SPAGMK). 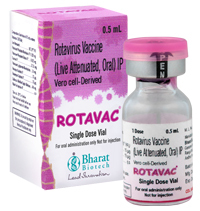 Rotavac consists of 116E strain prepared in Vero cells. Each dose of 0.5 mL contains NLT 105.0 FFU of live rotavirus 116E. As per the recommendations, the vaccine is to be administered as a 3-dose regimen, 4 weeks apart, beginning at 6 weeks of age and should not be administered to children older than 8 months of age. Based on a double blind study published in Lancet, the efficacy for severe non-vaccine rotavirus gastroenteritis was 56.4% in the first year of life and the vaccine efficacy in the second year of the same study was 49%. The findings was heavily debated since a near 50-60% efficiency is not really good. There are 2 ways of looking at it. Chandrakant Lahariya commented, “ In a disease like rotavirus-related diarrhoea with a huge burden it will indeed have a huge impact in terms of the number of lives saved. Interventions in all ways should be tried to save the maximum number of lives. The price of the vaccine at just about US$1 is also not so huge.” Jacob Puliyel comments, “It is a toss-up if the vaccine will work for you. If 100% [of the] population is vaccinated it will reduce 50% [of the] rotavirus deaths. What are the numbers needed to treat [to prevent one death]?”. Despite the efficacy not being ideal, the vaccine has been licensed and launched for use earlier this month. Scientists have urged that more work is needed and there is scope for improvement. As Soumya Swaminathan, director general of ICMR states "It can certainly be better because 50-60% is not the ideal efficacy rate. And so there is research underway to improve efficacy because one of the observations that has been made is that the efficacy of oral vaccines is generally lower in India than it has been in developed countries -- the same had been observed with polio also. The exact reason is not known, but it could be related to the high rate of enteric infections (related to the intestines) that children here have. People are looking at various strategies to increase the efficacy of the vaccine and of course there are people who are looking at different vaccines also. So maybe in the future better vaccines may be available. But at this point in time, we have a good, cost-effective vaccine". I wonder if antibiotic sensitive Staphylococcus aureus exists in clinical samples. Almost every strain I have been looking at is now MRSA. Many strains have gone beyond and have acquired a variety of properties. S aureus forms one of those glorified pathogens and forms one of the most common pathogen under Gram positive cocci category. Other species of Staphylococcus is also slowly showing up at higher rates. S aureus is part of the ESKAPE group of organisms all well known for their ability for infection and antibiotic resistance. Of all the classes of antibiotics, β-lactam antibiotics are the most preferred members. Among the sub classes, Cephalosporin's are the favourites. They are further classified into different generations depending on their development and activity. Currently 5 generations are recognised. The 5th generation cephalosporins are considered to be the latest among the group and have broad spectrum activity. Well known examples of 5th Gen Cephalosporin's include- Ceftaroline and Ceftobiprole, both of which are well indicated against MRSA. In a post on Avibactam long ago, I mentioned that simply inventing a more complicated β-lactam antibiotic is not going to work for a long time. We need a magical way to refurbish the older antibiotics. One way of achieving it is to find new β-lactamase inhibitor. 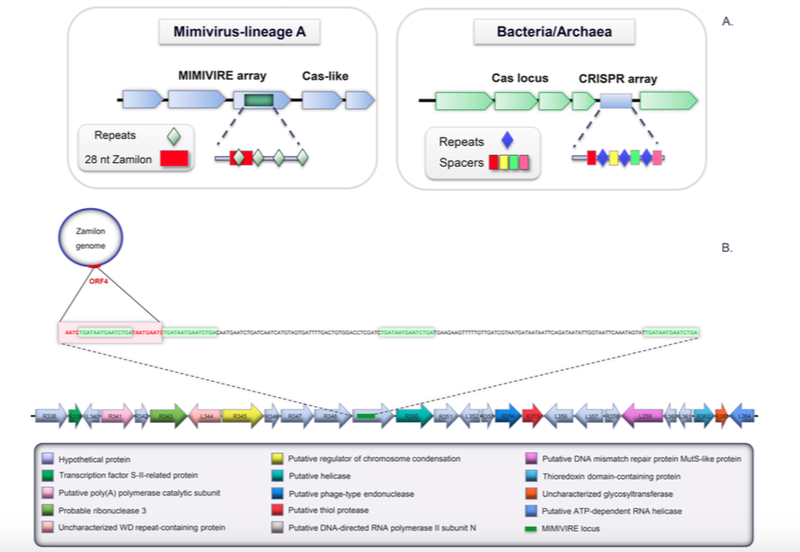 Fig 1: Structure of Tarocin A and Tarocin B.
MRSA forms a special case of interest since a majority of the MRSA doesn't have a β-lactamase to begin with. Instead they have a horizontally acquired alternative penicillin-binding protein, Pbp2a. More recently studies have shown that MRSA can be rendered susceptible again, provided we interfere with teichoic acid biosynthesis. 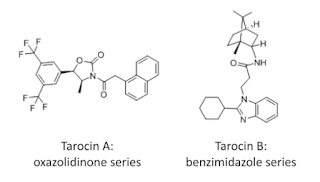 There are many different Wall teichoic acid inhibitors (WTAi) such as Targocil, L275, L638, L524, L555. However, they have efficacy and toxicity issues. 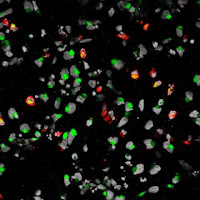 In an attempt to resolve the issue a team led by Roemer (Merck Research Laboratory) screened 2.8 million small molecules for effective teichoic acid inhibitors. They found 2 chemicals inhibiting the first step of teichoic acid synthesis. The chemicals where named as tarocins- A and B. See Fig 1 for chemical structure. A derivative named as tarocin A1 displayed complete depletion of the wall teichoic acid polymer. Further analysis showed that tarocins by themselves had least bioactivity and no cytotoxicity. The target of activity was also confirmed as TarO by finding resistant mutants and subsequent whole genome sequencing. As a proof of concept, researchers also tested for its synergistic activity with several β-lactam's and the results are quite convincing. Scientists all over the world are going through a financial bottle neck. There are too many qualified bonafide researchers with far less tenure positions to accommodate. India is not different. With pressure mounting for better and larger scale of research there is increased need for funding and annual country budgets are looked upon with great interest. This year's Budget proposal has met with mixed emotions from a variety of sectors. Here's a peak into Research R&D budget. The budget proposal this month is currently under consideration and is expected to be revised and passed the start of the fiscal year on 1 April. 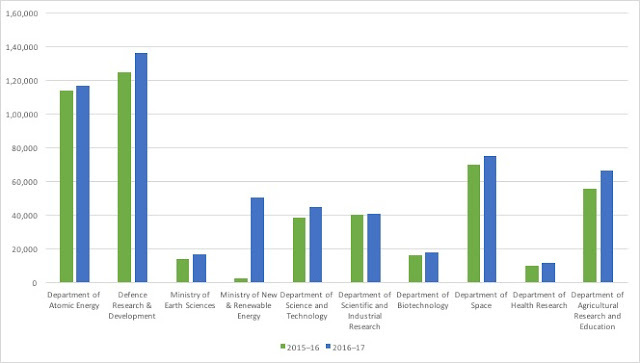 This budget has seen an increase for Science and technology. The major departments to get an upgrade include agricultural research Earth sciences and Department of Health Research’s. See Fig 1 below for comparison of budget proposal (with reference to 2015 fiscal year). It has been noted by many that India is rapidly becoming a research place of interest, but to cope with scenario we need a greater rise, though some have commented that this is a healthy increase. Academia and academic research needs a better budget. Though there is a overall increase by about 12% to academia most of it will be channeled to support Man power for teaching. Amitabha Mukherjee comments, University research will face serious challenges, We do not buy new equipment, cannot maintain existing ones well, do not upgrade laboratories, and cannot even get good external speakers unless they are visiting Delhi since we cannot afford to pay even for their inland air travel.” Moreover, the proposal includes installation of new world class research facilities and upgrade existing one's. There a numerous barriers for current Indian science. There was a severe bashing of the poor quality of scientific temper in the country in a 2015 article. I agree with most of the comments and observation made. There is a need for massive boost and a mere less than 20% increase will not be sufficient considering the inflation and rising scientific standards all over the world. 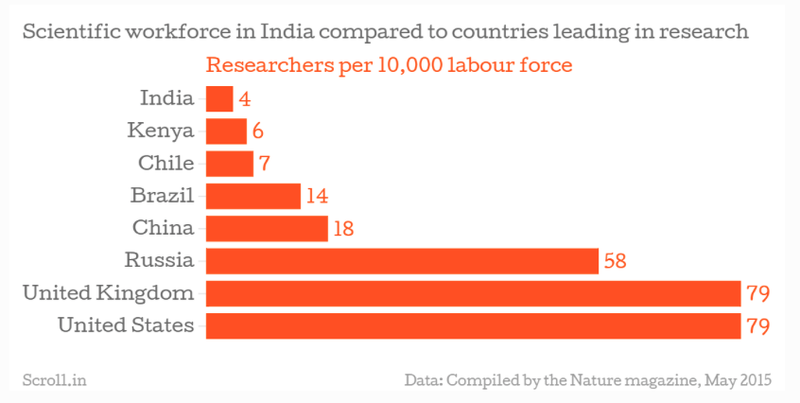 As a matter of fact India stands behind countries like Kenya, Chile and Brazil in terms of Scientific workforce. The Fig 2, speaks for itself. And nothing much has improved in comparison to last year. In conclusion, there is an opinion circulating that this is a draft and there will be changes. So it maybe early to comment. Overall, there is a mixed reaction. It is my personal opinion that a couple of million rupee increase mayn't do much. There is a need for real large scale increase, especially if we want to boast for ourselves as a developing scientific nation.